The saga of the Demoulas family and their Market Basket supermarket chain may sometimes read like a soap opera, but it’s really more of a drama from Classical antiquity, complete with warring cousins, hand-to-hand combat, strife among prosperous citizens, and even a wayward son named Telemachus. It began nearly 100 years ago, when the late Arthur Demoulas opened a grocery store in Lowell. Over time, his store grew into a regional supermarket empire. 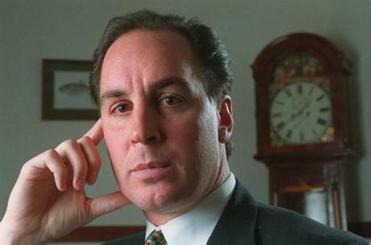 But while the Demoulas family kept control of that empire, they couldn’t control the infighting. 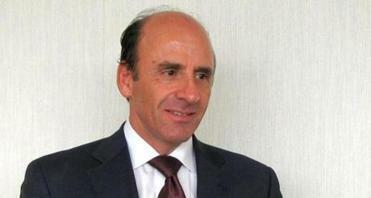 A bitter feud split the family, and in the most recent installment, it has led one grandson, Arthur S. Demoulas, to oust the current president, his cousin and namesake Arthur T. Demoulas. How did the situation get to this point? Here is a Cliffs Notes version of the Demoulas epic. Demoulas Market Basket is a supermarket chain, with 71 stores and 25,000 employees across Massachusetts, Maine, and New Hampshire. It’s not a public company with shares that just anyone could buy or sell. It’s one of the oldest family-owned businesses in the US, which means that those stores, and the $4.6 billion in revenue they generate, are all controlled by the Demoulas family. In 1954, the founder, Arthur Demoulas, sold the business to two of his sons, Telemachus and George. They turned their father’s store into a fast-growing business, opening 15 different locations and building a brand trusted for discount pricing. But then George died in 1971, and that’s when the trouble began. 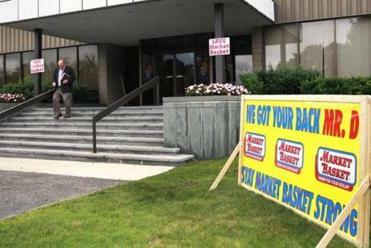 Employees have posted signs inside and outside company headquarters in support of ousted president Arthur T. Demoulas. Telemachus and George had been equal partners, and George’s family assumed that they would inherit his 50 percent share. Telemachus apparently disagreed. Little by little, he took control of those shares from his brother’s family — his nieces and nephews. Did George’s heirs fight back? To say the least. In the early ‘90s, they filed suit against their uncle Telemachus. The case was rich with resentment and acrimony. Family members accused one another of greed, drug abuse, and extramarital affairs. Two of the attorneys for Telemachus’s side were eventually disbarred for their conduct. During one memorable court recess, Arthur S. (George’s son) and Arthur T. (Telemachus’s son) started to duke it out. Ultimately, the judge ruled in favor of George’s heirs. They were given 51 percent of the company, a controlling share. Have George’s heirs controlled the company ever since? In order to control a company, you need something more than the majority of shares. You need that majority to vote together as a bloc. And for a number of years that didn’t happen in the Demoulas case. There was one person from George’s side of the family who wouldn’t fall in line with Arthur S. and who voted instead to support Telemachus’s son Arthur T. It was only thanks to her support that Telemachus’s side of the family kept control and Arthur T. himself became president, a post he held until this summer. How was Arthur T. driven out? It started in 2013, when that one relative who had been switching sides changed her mind and decided she was going to vote with her side of the family, lead by Arthur S.
Does any of this matter for the supermarkets? It’s hard to say. A change of ownership can mean a change of direction. 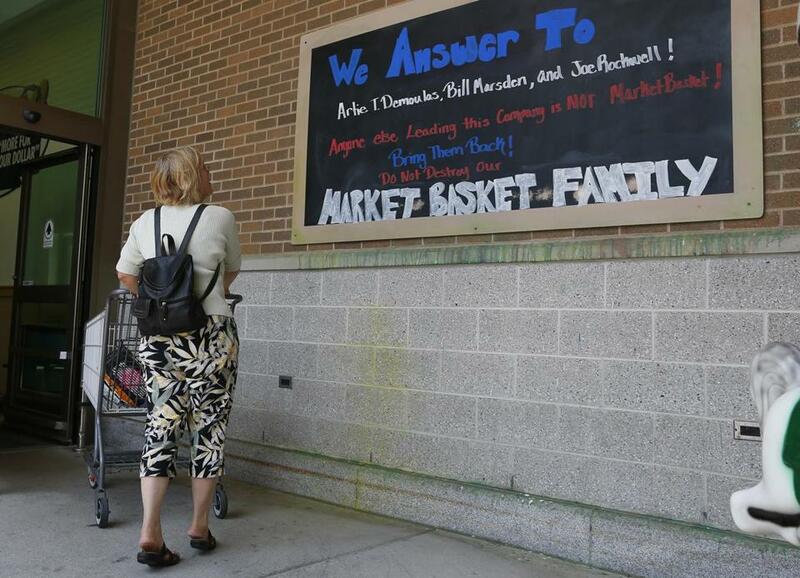 Employees at Market Basket stores have some concerns, perhaps partly because they had been generally supportive of the now-former president Arthur T.
But the company insists that there won’t be any big changes. All this fighting hasn’t been driven by competing visions for the company’s future, just competing claims about who is the rightful heir. Or, if you prefer, competing interpretations about who is the real hero in this multi-generational Massachusetts epic.